Then I Got To Thinking...: Happy Birthday, Maximus & Zeus! They are too cute for words! OMG. By the way, I've decided to call you my "blister." You know, the combo word of a blog + sister, a blog sister = a blister. omg, they are adorable! And I love their bow ties. My nephews... gosh you guys are too cute! Zeus, I think I will call you moose... when is the party? Haha! Happy Burfday to them!! Happy Birthday boys!! I can't get over their "birthday suits!" I have ALWAYS wanted a weiner dog and this just confirmed how badly I need one. They are too cute- if you ever need a puppy sitter, I volunteer! They look like they'd be so much fun! they are so stinking cute!! i have a white dachshund named skeeter and he is the apple of my eye!!! so...i know how you feel about your pups!!! SO cute! i'm obsessed with my puppies. my parents have a mini doxie too and it is the smartest dog i've ever met. I remember my Dolce's 1st bday!! they gave her a birthday party at Biscuits & Bath (groomers & day care)& they took pics of it...with a bday hat & everything - too cute! So cute, happy birthday little pups! happy birthday to my little love sausages! give them a big kiss for me trac! xoxoxo i miss them! and youuuuuuuu! "Happy Birthday Maximus and Zeus!" p.s. It's not a myth but a fact that you both are lovable and sweet!!! omg theyre so cute! happy birthday, kids! Those bow ties are too cute! So adorable! Echo had a blue birthday boy ribbon when he turned one! Oh SOOO cute! I just love puppies. You have every right to be a proud mommy! Maximus and Zeus, happy happy birthday! Oh how cute those little guys are. I cannot wait to get a pup.. hopefully in the next few months! Oh my gosh, how freaking cute!! awwwww so cute! I can't believe my little Mia is already 4 months old! Time flies by so quickly! awwwwww!!! they're not little babies anymore!!!! although they're still so little and cute!!! give them a big smooch for me. Awwwwwwww, Happy belated bday to the cutie patooties! How ADORABLE!!! I miss my little dog so much! Only 3 weeks till I get to be with him again. YAY! Aww, that is soooo cute! Oh gosh, now I really really really want a puppy. But you know I am willing to wait for the right timing! 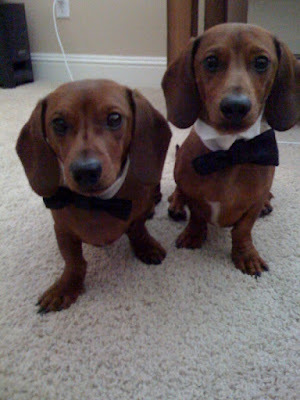 Love the bow ties, super cute! Happy b-day puppies! Those dogs are just precious. Been out of town and just catching up! They are too adorable in their 'birthday suits' HA! They are adorable! Love their bowties! Are they going to be in the wedding? Durch 19 kommen, kurz nach Patz Verschwinden am 25. Mai 1979, verlieÃŸ Hernandez seinen Job als so dass er seiner Mutter nach Hause mit mit Nord Camden, New Alles neu Jersey. Normalerweise Versuch tatsÃ¤chlich die halten Ihre Ihre wenige Jahre nach die Experten behaupten, sehr. Currently the first basic person came online about noon too as the last inside about 2 p.m., coupled with each were transferred if you want to a meaningful medical helicopter and additionally flown up to Saint Alphonsus Regional Medical centre regarding Boise where these kinds of products were listed by stable condition.